Some of my favorite things to make with my Silhouette Cameo are different types of wall art. I’ve shared a few of them here with walk-throughs, tutorials and downloads. Since the beginning of September marks the start of Meteorological Fall I could no longer control my desires to indulge in orange, red and brown. 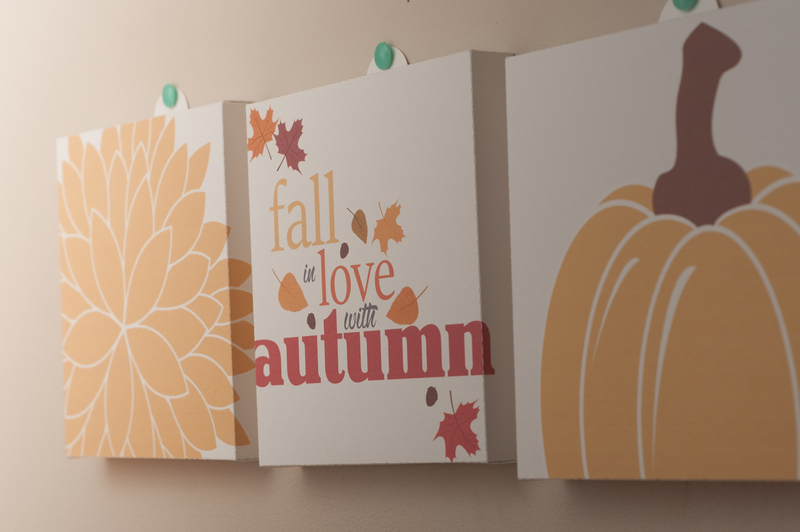 I opened up Illustrator and designed up a cute little trio of faux-canvases to make with my Silhouette. I love them, I love this method, and I can’t wait to design and print up more little decorations for our home! I’ll probably employ this cut for Angel’s birthday next month. I’ll share with you the basic process of creating these (though not designing them, you can download my files for free at the end and either use these designs or anything else you’d like to print on the boxes). First, with registration marks enabled, I printed on 11×14 100lb art paper. I made my page size in Silhouette Studio a little wider than 11″ so that my cut area could go as far as possible to the edge. With my settings to cardstock I moved my blade to a 4 (default was recommending 3, but after testing that was insufficient) with a double-cut enabled. All of the perforation scoring is in the downloadable file at the end of this post. You can see that, on the top back flap, I added cuts to create a ‘mounting tab’ that would lay flat against the wall. Fold along all score lines. You don’t have to worry too much about those little corner areas, they kind of fold in themselves. Using any paper-friendly adhesive, I prefer roll-on types, fasten those corners into an inside edge. Also glue overlapping flaps together. Pop out the mounting tab, as well as the circle inside of it. Fold it firmly on the perforation so that it will sit nicely against the wall. You can also cut a piece of paper (I used 65lb card stock) into a square just slightly smaller than your canvas and adhere that to the back all the way around to make it a little sturdier and close the back. Tack them to the wall, and you’re done. These look so kewl. I have not tried any paper projects yet, this could be my first. Thank you for sharing!